Metal-based Functionally Graded Materials (FGM’s) were somewhat of a theoretical exercise prior to the advent of additive manufacturing. Many applications of FGM’s have been conceived, but very few have moved to production. The idea is to make a composite material by interweaving two or more independent metals through thickness with a specific gradient. By interweaving multiple metals, the resulting product can combine the best properties of both constituents. The material property to be optimized can be thermal conductivity, strength, toughness or corrosion resistance. While layering of different metals occurs locally, the goal is to affect the global properties of the component or provide optimization in a specific location of the part. Fabrisonic’s expertise is in a metal printing process that uses a low-temperature, solid-state or no melting welding technology. 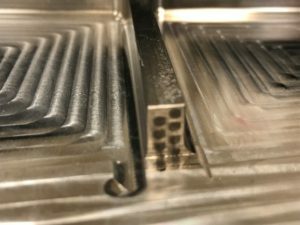 Ultrasonic Additive Manufacturing (UAM) allows ‘printing’ of thin metal foils to build up solid metal parts at temperatures near ambient. The bond permits joining of dissimilar metals without the undesirable metallurgical interactions seen in other additive processes that melt. A wide range of material combinations can be printed in a single part opening the design space to enable property gradients and engineered material. UAM capability has been used in many applications to leverage the possibility of FGM’s. A textbook example involved work with the US Army Research Lab (ARL). UAM has been used to build up varying compositions of aluminum and titanium. 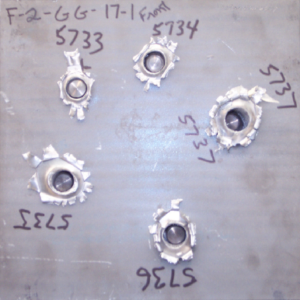 The experts at ARL were able to simulate the ballistic behavior and engineer a gradient “formula” that provides the best mix of strength and ductility through the thickness. UAM was then used to print each desired ‘recipe’ and large panels passed rigorous ballistic requirements. A wide range of thermal applications have also leveraged custom FGM’s. In particular, cooling systems for electronics packages are ripe for the combination of UAM and dissimilar metals. Aluminum and copper FGM’s are used regularly to create high performing heat exchangers. 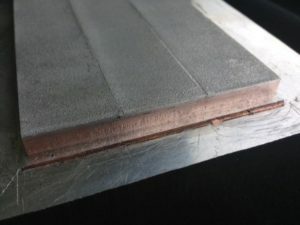 By printing copper in strategic locations, designers can wick heat out of a critical location without having to build the entire structure out of expensive and heavy copper material (lightweighting). At the same time, 3D printed FGM’s in aerospace applications can be used for electronic shielding. 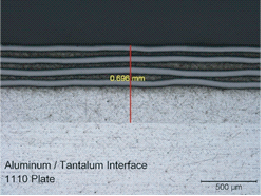 By interweaving layers of tantalum or tungsten on a panel of aluminum, delicate electronics can be shielded from harmful radiation. Both thermal and rad hardening FGM’s can be printed in the same panel at the same time, further optimizing performance. Another thermal example is varying CTE (coefficient of thermal expansion) through thickness on a cold plate. 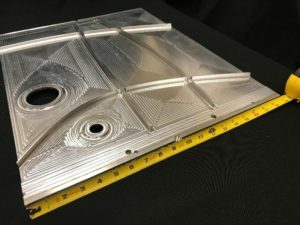 Most cold plates in the industry are made of aluminum or copper which have drastically different CTE’s than electronic packages (mostly silicon). By interweaving molybdenum and Invar through the thickness, FGM’s can be created to allow optimized thermal conductivity without inducing high thermal stresses across the interface. In addition to FGM’s made entirely of metal, UAM can be used to integrate other materials. 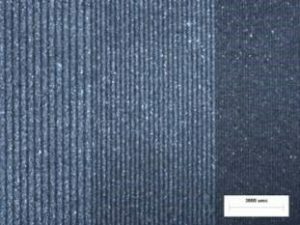 Recent work has focused on printing ceramic fibers into a metal matrix creating a metal matrix composite (MMC). This is akin to adding rebar to concrete as the ceramics can have 5-10 times the strength of the monolithic aluminum. By printing the ceramics in specific high loaded regions, the overall part can be made as light as possible. The embedded ceramics have also been shown to drive fatigue life improvement of several orders of magnitude. — The ability to embed sensors and electronics in a solid metal structure without damage. Because the process only reaches about 250°F, the low-temperature allows us to embed thermocouples, fiber optics, USB ports, and more for health monitoring purposes. — Creating complex internal geometry. With a CNC stage, internal and external surfaces can be milled completely smooth for low pressure drop in heat exchangers. Fabrisonic builds to near-net shape, then comes in with a CNC to finish the part shape to exact specifications. Combining the subtractive with the additive is where we get our hybrid process. 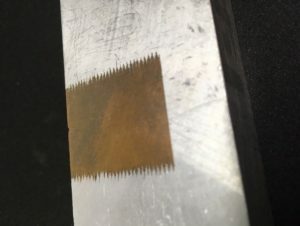 Now that there is a bit more understanding of how dissimilar metals can be engineered into unique solutions. Reach out to us at www.fabrisonic.com and see if we can help with a solution. Let the brainstorming begin!